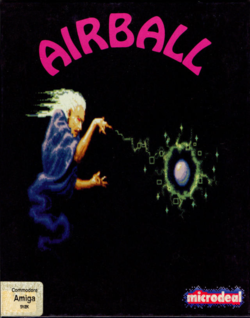 Airball is a videogame released in 1987 by MichTron/Microdeal. The game was originally released for the Dragon 32/64, with ports following for the Atari ST, Amiga, PC DOS, Atari 8-bit, and Game Boy Advance. Airball was also ported to the Apple IIGS, but due to a curious lack of marketing, saw an extremely limited run with less than 150 sales for the platform. A version for the NES was under development, but cancelled; however, several partially complete prototype cartridges exist. Players assume control of a human that has been transformed into a rapidly deflating ball by a wizard. The goal of Airball is to find the wizard's spellbook and return to human form. Navigating the levels is accomplished with the directional buttons and a jump button. The view is isometric, which can often make complicated movements (such as jumping across gaps or weaving through obstacles) difficult. Points are gathered in the form of gems that appear randomly in rooms. Players pass through the gems to collect them. Airball can ascend stairs by jumping. The surrounding spikes, one of many obstacles found in the game, cause the player to burst. The yellow bar is the amount of air left in the ball, and the three balls in the lower left of the screen indicate the remaining amount of lives. This page was last edited on 21 April 2009, at 16:06.